It's easy to skimp on nutrition at breakfast—from processed baked goods and cereals to fattening diner-style egg and meat dishes, unhealthy choices are prevalent at the first meal of the day. Cutting out dairy is one way that you can decrease unnecessary saturated fats and cholesterol in your diet, and it's probably easier than you think, especially at breakfast. Here are 10 healthy breakfast ideas that those eating dairy-free (or simply the health-conscious) will love. Most of these recipes are versatile, so feel free to use your favorite dairy-free milk and your favorite fruits and spices. In addition to reducing your intake of saturated fats and cholesterol, adding complex carbohydrates to your diet while reducing the number of unnecessary sugars is another way to make your breakfast a little bit healthier. This breakfast quinoa is a simple, healthy, delicious morning meal that even the kids will like. Prepared with protein-rich quinoa, dairy-free milk, bananas, coconut, and just a dash of a sweetener of your choice (such as agave), this meal tastes good and feels good to eat. For breakfast eaters that prefer savory starts, try a baked quinoa prepared with quinoa, eggs, broccoli, and soy milk or almond milk. Savory breakfast quiches of French origin are typically prepared with cream, cheese, and butter, which, needless to say, is not the healthiest choice for everyday breakfasts. This collection of dairy-free quiches contains four healthier favorites, all of which are prepared without any dairy while boasting lots of ​flavor. The basic recipes—both with crusts and without—are provided so you can add your favorite meats, vegetables, and herbs. If you've never baked oatmeal before, you are missing out! Baked oatmeal is a classic Amish dish that is traditionally prepared with butter, milk, and eggs. 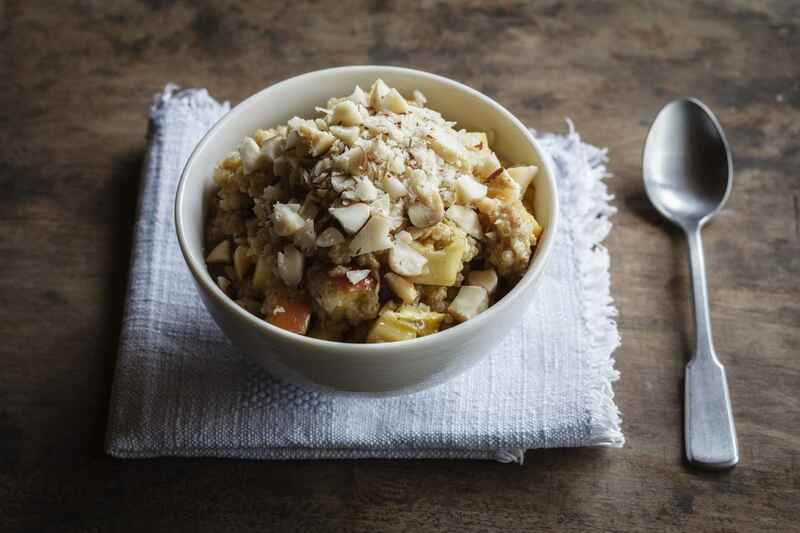 This baked oatmeal recipe is a healthier version of the comforting breakfast classic, prepared with almonds, healthier sweeteners, almond milk, and fruits. And it is incredibly versatile—add nuts or dried fruits of your choice, and use whatever fresh fruits and berries are in season. Quick breads are perfect for breakfast because they're easy to prepare—you just need to plan for the hour baking time. Although most quick bread recipes call for butter and eggs, there are ways to make them dairy-free without making them taste like it. This banana bread is nice and moist with just the right amount of sweetness. If you are short on time, fill muffin tins with the batter and bake for about half of the time instead. What parent would approve eating a cookie for breakfast? A parent who just whipped up these healthy vegan date and macaroon treats! Three simple ingredients—dates, banana, and coconut flakes—are blended in a food processor and then baked into soft, golden brown cookies. A healthy, dairy-free way to start the day. This basic muesli recipe takes only moments to prepare but keeps well in an airtight container for an easy, healthy homemade breakfast. 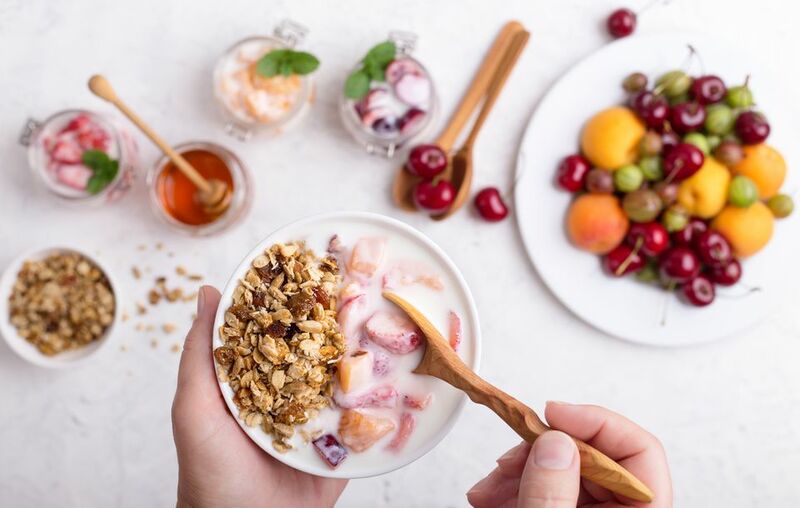 Muesli is lower in fat than granola and prepared with healthy ingredients like dried fruits, nuts, oats, seeds, and coconut. Enjoy with dairy-free almond milk, soy milk, soy yogurt, or coconut-based kefir for a simple, tasty breakfast. Making a tasty smoothie is a quick task in the morning and often ideal to use up the fruits and vegetables in the fridge, creating endless combinations. Of course, smoothies are also naturally healthy and can range from a sweet beverage to a more savory drink. Add a few spoonfuls of your favorite dairy-free soy yogurt or dairy-free kefir for some extra protein and healthy bacteria. Prepared with banana, mango, orange juice, spinach, and just a touch of honey, this recipe is an easy, refreshing way to start the day. Tofu for breakfast? You might not believe it, but tofu is actually a wonderful ingredient in healthy breakfast dishes like this tofu scramble. Not only is it a great dairy-free source of calcium, but it's also loaded with other nutrients like protein and healthy fats. A simple recipe with onion and store-bought salsa, it makes a flavorful, nutritious dish that is easy and quick to prepare. Muffins aren't something we usually think of as health food since most muffin recipes call for butter and lots of sugar. But this recipe includes coconut oil and coconut for moisture and sweetness, and the almond meal and banana add a bit of nutrition. Just 15 minutes in the oven and you will have a tasty breakfast treat to share with the family. Homemade granola makes a delightful dairy-free breakfast when coupled with dairy-free soy yogurt, coconut milk-based kefir or dairy-free soy milk and fruit. It takes only a few minutes to mix together and then an hour or two in the oven, and it keeps for weeks in an airtight container for healthy breakfast and snacks. Simply substitute vegan butter in this simple homemade granola recipe prepared with tasty nuts, seeds, and natural sweeteners. Then feel free to add dried fruit, blueberries, cherries, cranberry, or coconut.